After learning of all the clearing efforts by the volunteers and the Buckeye Trail Organization earlier in the year, I decided to investigate the newly cleared Trail bed in the East End of Henry County. As I walked on, I admired all the efforts of those who so graciously gave of their own time to this great cause. I was on the Towpath Trail of the Miami, Wabash & Erie Canal, in Henry County, Ohio located between County Road 1 and County Road 2b. This Trail is part of The Buckeye Trail and also the National Park Service’s North Country Trail. I am still amazed to be walking next to this great old canal where countless ancestors had traveled in the middle 1800’s. As I walked, I eventually came upon a Canal Lock. There is a series of these along the canal. They were used to raise and/or lower the canal boats to changing levels of elevation as the topography gradually changed along the way. The lock I found myself at was called “Rice Lock #42”. As I gazed and marveled at it, I became curious because most of the other locks along the way have been constructed using quarried stone. 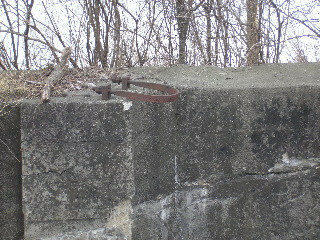 This lock appears to have originally been constructed much the same way, but later modified using cement. I later found out that construction of the Erie Canal in New York created the first demand for cement to be imported to the US. The first recorded shipment of Portland cement to the US was in 1868. In 1871, the first Portland Cement Plant was established in the US in Coplay, PA. Locks originally constructed of wood were rebuilt along the Miami & Erie Canal beginning around 1870. 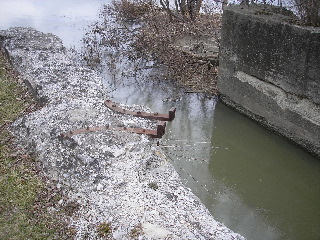 I am familiar with a lock near Defiance which was reconstructed around 1906 using cement. I wonder when this Rice Lock #42 was reconstructed. As I walked on, I also wondered why it was that this lock was called “Rice” lock # 42. Who or what was “Rice” referring to? 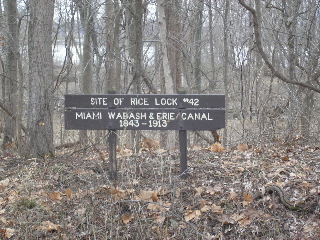 The Sign also referred to the Canal as the “Miami, Wabash, and Erie Canal”. I later learned that this section of Canal from Junction, Ohio to Toledo was originally part of the Wabash and Erie Canal which came over from Indiana. Later, as the Miami & Erie Canal was finally completed, and worked its way up from southern Ohio up to Junction, it merged and became the “Miami, Wabash, and Erie Canal”. I continued to marvel at the lock. As I continued my hike, I came closer to The Lucas County Line. It was here that the old ghost town of Providence lies. Providence became a ghost town. After being a thriving Canal Town complete with a sawmill and gristmill, tragedy struck in 1846 as a fire ravaged the town destroying its central business district. Later in 1854 a Cholera Outbreak killed most of the inhabitants. Finally in 1928, the Town was officially removed from official records. The remaining buildings were designated a Historic District by the Department of the Interior. 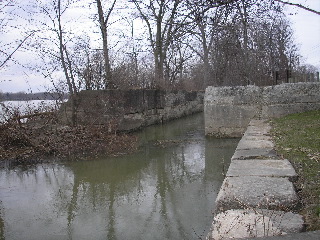 Later the Providence Dam was constructed. Providence was directly across the river from Old Gileod- a village today known as Grand Rapids.